We offer a complete rubbish clearance service in West London covering all West London postcodes : W1, W2, W8, W9, W10, W11 and W14. If you need builders waste removing or garden waste collecting or any household or office waste removing we have friendly, helpful drivers who undertake all types of rubbish clearance excluding hazardous waste, asbestos etc. We operate a wait and load service which works out much more efficient than hiring a skip in Maida Vale or other areas of West London. 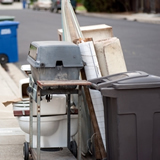 If you want to hire a skip in West London you will need to apply for a skip licence from Westminster Council or the relevant Borough council. . Our rubbish clearance service avoids the need for a skip licence. From Holland Park, Kensington, Ladbroke Grove, Portobello Maida Vale as well as Notting Hill, we collect and remove rubbish. All rubbish collected in West London is taken to Quattro UK Waste Transfer station in Park Royal,London NW10. Where it is graded for recycling if possible. 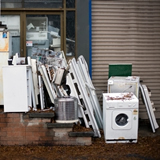 Quattro Uk are licensed by Defra to manage waste.